The Whole Family Got Their Craft On | Paper Glue Etc. 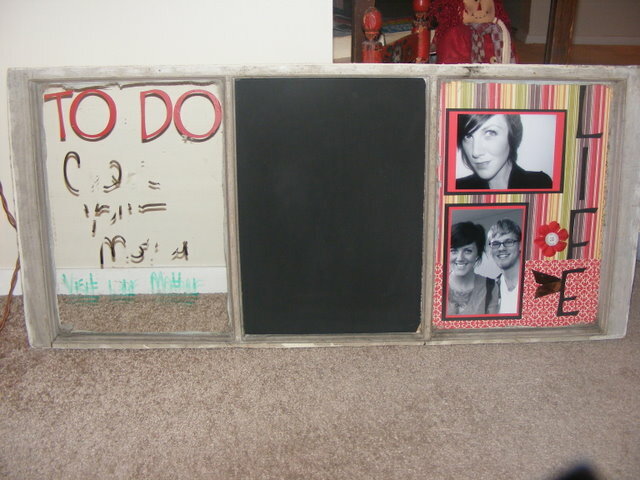 Crafting this week was a family affair, I’m so mad at myself that I didn’t get a group pic….what was I thinking? On Thanksgiving I challenged my kids, their significant others, my hubby and myself to a “handmade $10 gift exchange”. I wish you could have seen the looks I got; however being the good sports that they are they took my challenge….I knew I was going to make each person something and when we drew names this is what we came up with this….. 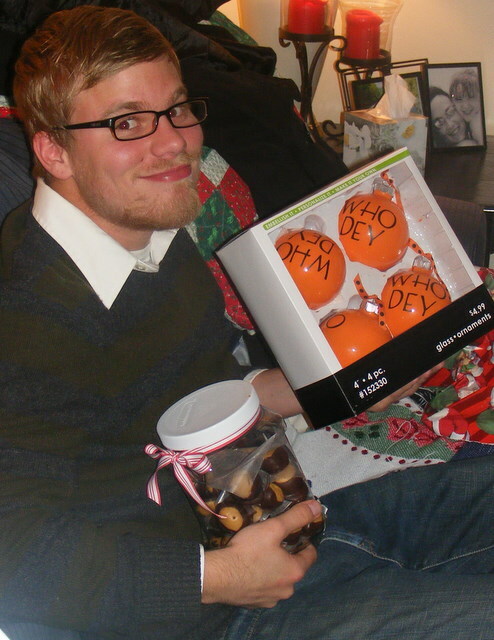 The First Born Got her boyfriend Scot with 1 T and she made him a container full of Buckeyes (his favorite), I made him a set of “Who Dey” ornaments…you’d have to know something about football and The Bengals to know how important these ornaments were. I was really trying to score him some points with his roommates since I’m sure The First Born “girlyfied” his Christmas tree. 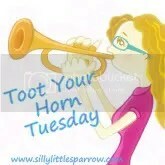 Scot with 1 T got Mr. Perfect and I didn’t get a picture of his gift, he made him a container of Buckeyes and Chocolate No Bake Cookies which Mr. Perfect loves. I made Mr. 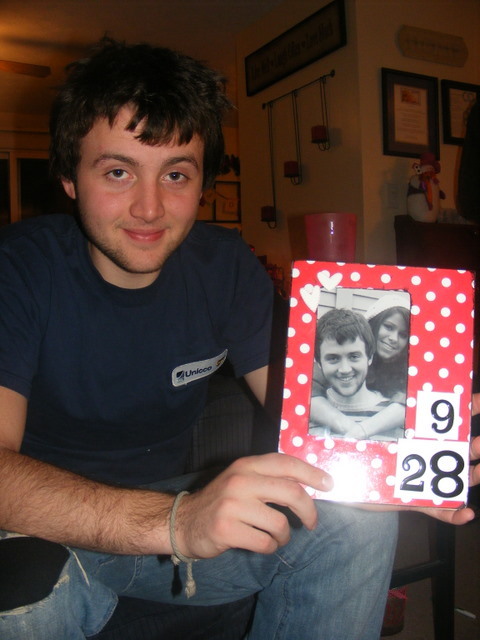 Perfect a frame with his and Brianna’s anniversary date. Mr. Perfect was a lot more excited about his cookies than he was about my frame. Please pay no attention to Mr. Perfect’s hair, he is growing it out for Locks of Love. So moving right along, Mr. Perfect got his little sister “The Baby Girl”. 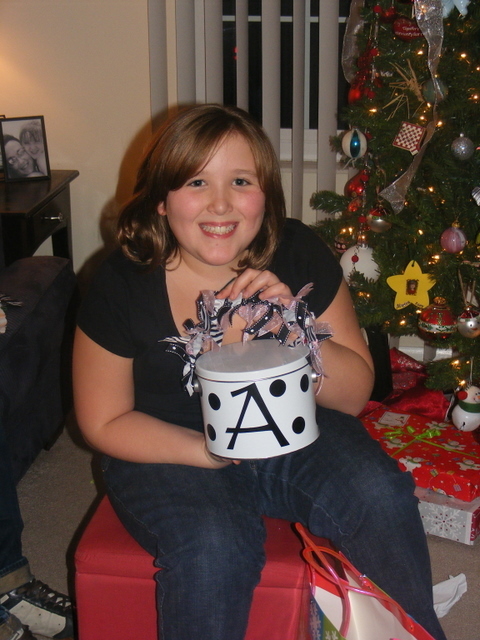 He made her pretzel cookies with Hershey Kisses and M&Ms and put it in a really cute bucket that he personalized. Watching him sit in the middle of “The Happy Place” and get his craft on was PRICELESS! I used my new BFF (The Cricut) and made her a sign for her bedroom. The Baby Girl drew Brianna’s name (Brianna needs a nickname) and she made her a necklace and I made Brianna a framed scrapbook page of her and Mr. Perfect. The Baby Girl was thrilled because she put her necklace on and wore it all night. I am pretty sure no one wanted my name which is funny because I would appreciate ANYTHING, Brianna got my name and I can’t even tell you how much I luv luv luv my gift. She made me photo holders, one for each kid. I’m going to make a set of these for a friend and I’ll share the details. She gets an A+! You might be wondering if you are keeping score who Mr. Wonderful drew, well let me tell you. He drew HIMSELF! Yes, I said he drew HIMSELF. He didn’t tell me until later in the day. I offered to switch with him, but he said he already knew what he was going to make to impress himself. Can you say Scrooge? He made himself cookie brownies and The Baby Girl and I made him chocolate chip cookies. EVERYONE agreed with me that it was an awesome idea and a new tradition for us. I can’t even tell you how much I enjoyed this night. 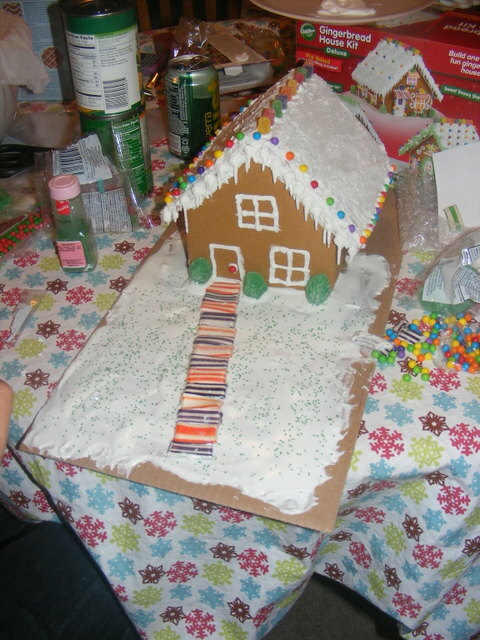 I made tons of food and we decorated Gingerbread Houses. 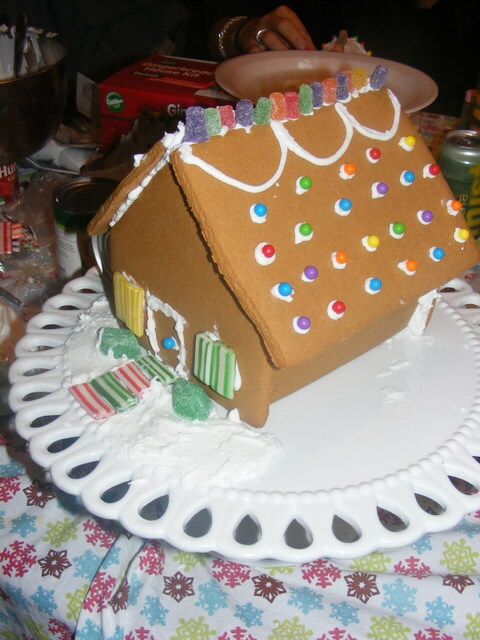 This entry was posted in Christmas, cooking, crafts, decorating, family, Handmade Christmas, holidays and tagged Christmas, crafts, Gingerbread Houses, Handmade Christmas. Bookmark the permalink. I enjoyed this so much!!! What a great idea and everyone participated with such amazing gifts. It must be such a fun time at your house at the holidays! 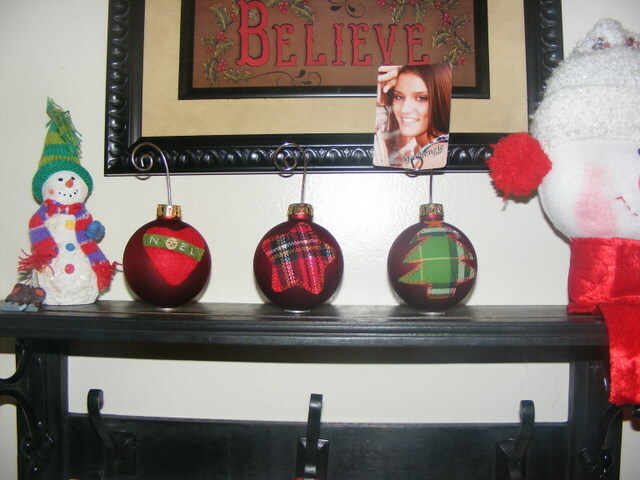 And, yes, please do share the how to’s on the ornament photo holders. That’s great idea. I’d try it if I thought anyone would participate, but I know I’d be the only one crafting! (Maybe my daughter) But daughter-in-law would definetly wig out at the idea as she is beside herself taking care of a 1 and 3 year old!! And my son would just say “WHAT!!!!!! And there it would be! Now, my sister definitely would. You mean to tell me Carl drew his own name and didn’t tell you right away???? He is now dubbed “Mr. Scrooge.” What a weiner. What’s this sugar scrub thing you say you are “making?” Details, details, details. I love the idea of making gifts. What a talented family you have, not to even mention cooperative! This was a fun entry to read. Thank you for stopping by junkblossoms. Your comment was the best. 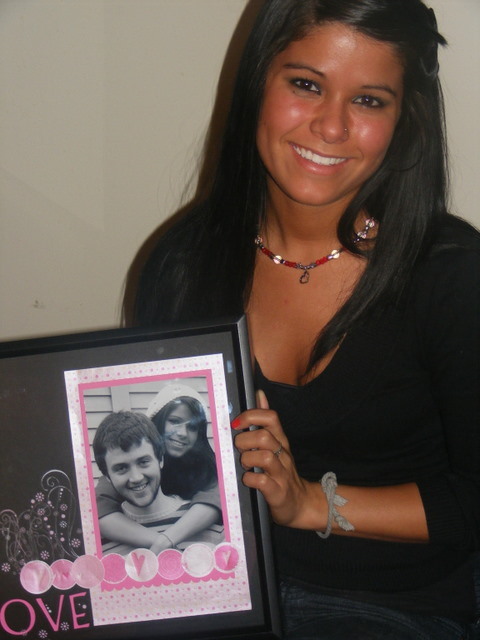 I’m glad your daughter loved the vanity. Please visit again soon. Merry Christmas to all! I freakin love this more than chocolate! Seriously what a fabulous idea! 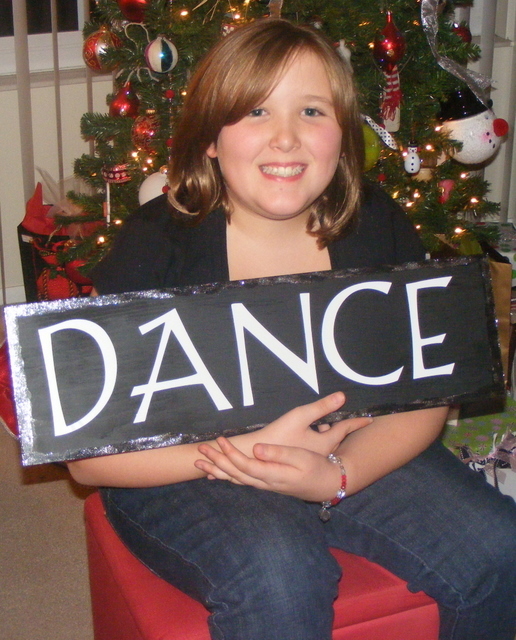 And the fact that your family participated … those gifts were AMAZING!!!!!!!!! !